Quick Flowering | Buy Cannabis Seeds that can Flower Faster! 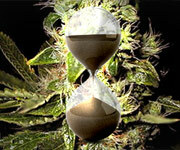 Need a Short Flowering Cannabis Seed? You’re in a rush and you need a seed to match…what do you do? Get one of the Gorilla’s speedy short flowering seeds… that’s what. The Gorilla goes to great lengths, & travels great distances to seek out & capture the very best & fastest ‘short-flowering’ cannabis seeds just for you. Now, doesn't that make you feel special? Get Your Short Flowering Seeds Now! Why Wait? Get 'em Now! BOOM! Flowering in only 6 – 8 weeks with explosive yields, a massive main cola and blue colours under the right conditions, these sweet berry tasting nuggets are a pleasure to own. A strong Indica High with a touch of Sativa. A potent crowd-pleaser since the 1990s, Pure AK is a lightning fast Indica/Sativa blend with an intense aroma! Rock-hard with a pale-lavender colour, Pure AK is pure pleasure! With so much experience behind the team at Gorilla Cannabis Seed Bank, they know just how much speed is important to you. And they know this isn’t just in terms of how fast your favourite strains of cannabis seeds can mature. All this combined allows Gorilla Seeds to confidently proclaim that they are the fastest and smoothest cannabis seed operation in the world. Get Your Speed Seeds Now!